Sciblogs | How much water does New Zealand have again? How much water does New Zealand have again? Today, Statistics NZ released a new assessment on the water accounts of the country. Back in June I distilled the previous 2005 assessment for you, and now here’s the update. The average amount of precipitation that falls on New Zealand each year, now based on data from 1995-2010, is 610,000 x 106 m3 — just over 10 times the volume of Lake Taupo. This is a bit more than the last estimate. The proportion of this water that in turn reaches the sea is 80% – little change there. Of course, averages hide variability among data. 1996 was the wettest year with 700,000 x 106 m3, and 2001 the driest with 550,000 x 106 m3. No surprise, then, that the largest drop in lake and reservoir storage also occurred in 2001. I wasn’t in the country then, but you may remember the news: drought, power crisis. There are also differences among regions. On an areal basis, the West Coast is the wettest, Otago the driest, and both come about because New Zealand straddles a subduction zone that has pushed up the Southern Alps. Compared with the last assessment, there are slight differences in the order of the regions in terms of the equivalent depth of precipitation and freshwater (see the figure below). You may also notice differences in rank between the two figures. 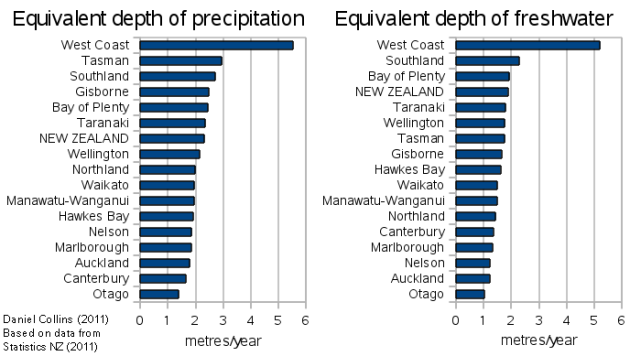 Tasman is #2 when it comes to the average depth of precipitation, but #6 in terms of available freshwater. The difference is evaporation: P = FW + E. The difference in rank is because not all regions evaporate the same proportion of water. This is largely due to temperature, but the landscape also plays a role: there’s more evaporation and less runoff from taller vegetation, all else being equal. MmÂ³ means in SI (Mm)Â³ or 10^18 mÂ³ or did you maybe mean hmÂ³ ? Just picking on your use of SI units here – did you say this web site is owned by the Royal Society of New Zealand? Ah, yes, thanks Ettema. I mean 10^6 m3. Corrections will ensue.